Rwandan High Commissioner to Nigeria, Amb. 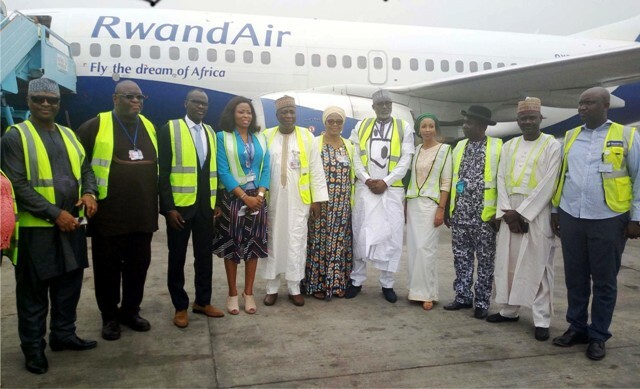 Stanislas Kamanzi (3rd left), with Country Manager for RwandAir, Miss Ibiyemi Odusi (4th left), Regional Manager, Nnamdi Azikiwe International Airport, Abuja, Mr Sani Mahmud (5th left) and others, during the inaugural Flight of RwandAir on Abuja-Kigali Route in Abuja, recently. The Managing Director, Federal Airport Authority of Nigeria (FAAN), Engr. Saleh Dunoma has said that the management is not only committed to sustain the statuses of airport certification, but to also continue the tempo so that other outstanding airports were certified. He has also described the certificate of the both Lagos and Abuja airports as one of the brightest moments in its annals, apart from when they were commissioned. Dunoma in a statement from the head, corporate affairs of FAAN Mrs. Henrietta Yakubu, and made available to aviation correspondents on Tuesday, urged all airport users as well as other stakeholders to increase their legitimate operations in and around airports, to enable FAAN serve them better. “Without any doubt, aerodrome certification project is not only beneficial to the aerodrome operator and the Civil Aviation Authority. “It is also beneficial to all aviation stakeholders, airlines and the travelling passengers. Benefits expected of aerodrome certification are legion. “They include lower insurance premium, attracting foreign investment, enhancing provision of safety of critical aerodrome facilities, service, procedure and personnel. “It also enhances collaborative decision making amongst airport stakeholders, especially between the aerodrome operators and the Civil Aviation Authority, safety and efficiency of flight operations as a result of improved facilities and services. “There is facilitation in development of regional hubs through improved capacity, safety and efficiency, attraction of inflow of capital investment into airport development and management such as concessing”, he stated. Dunoma posited that the whole essence is to enhance safety, security and efficiency in the airports. Next articleJune 12 At Last!